Coin collections have a profound and rich history, and to preserve that history you need to store your coins so they will not get damaged. Adequately stored coins will be worth more and will provide more money to your heirs when it comes time to sell them. Mints make coins out of metal, and except for gold, most will react negatively with a variety of different environmental factors. Some of the most common metals used in coins are copper and silver. These metals are also some of the most chemically reactive metals. If you know what the enemy is, you can create a defense plan to protect your collection. Humidity is a coin's biggest enemy. Copper and silver coins are one of the most common metals used in the production of coins. Unfortunately, these two metals will react chemically when they come in contact with water. Water vapor is all around us in varying degrees and it can seep into just about anything. Unfortunately, this is one of the hardest environmental causes of damage to coins to prevent. Some companies market coin holders as "airtight," but they are not guaranteed to be airtight. Heat, by itself, does not necessarily damage coins. But heat does reduce the time it takes for a coin to get damaged by other environmental factors such as humidity, acids, and air pollution. At the other extreme, cold can also damage the delicate surface of uncirculated coins when moisture condenses into liquid water that will deposit itself onto the surface of the coin. Acids come from a variety of sources. The most common source of acid is found in coin collecting supplies that are made out of standard paper and cardboard where acid was used in the manufacturing process. Over time these acids will leach out of the paper or cardboard and cause toning and tarnish especially on copper and silver coins. Adhesives used in packaging can also emit acids. Another source of acid is wood furniture and everyday household materials such as cleaning solutions and vapors emitted from cooking. Chlorine causes a chemical reaction that will negatively impact the appearance of your coins. This can range from minor unsightly toning to corrosion that causes pits in the surface of the coin. One of the main sources of this are flips made from plastic that contains PVC (polyvinyl chloride). Additionally, vapors from a hot tub or pool can seep into the area where you store your coin collection. Not only is air pollution harmful to our health, but it is also detrimental to the health of our coin collections. Air pollution is mostly a problem in dense urban areas where air pollution from vehicles can accumulate as smog and penetrate the surrounding buildings. Over the years steps have been taken to reduce the number of harmful gases that vehicles emit, but they can still exist in sufficient quantity to damage a coin. Improper handling causes the most preventable type of damage to coins. Touching a coin directly with your fingers can leave deposits of acids and oils that will damage the surface. Also, dropping a coin onto a hard surface can cause irreparable damage that will reduce the coins value. You should always follow safe coin handling techniques. Storing your collection in a box, jar or just tossed into a dresser drawer will cause significant damage to your coins. The first step in saving your coin collection is to ensure that it is appropriately housed in a coin holder, coin album or coin folder. In addition to protecting your coins from physical damage, coin albums and folders help you organize your collection by giving you a hole to place your coin inside the album. The folders and albums are labeled with dates, mint marks, and additional information so that your coin collection is simultaneously cataloged. As the old real estate adage goes "location, location, location" is everything. Where you store, your collection is just as important as how you store your collection. Your basic rule of thumb should be, "if the environment is comfortable enough for a person, it will probably be satisfactory for your coins." Extremes such as a basement (cold and humid) or attic (hot and harsh) must be avoided to keep your coin collection in the finest condition possible. A location in a den or bedroom is the best location. Additionally, choose a room away from the kitchen where cooking oils and moisture can quickly permeate your coin holders, folders, and albums. One of the safest places to store your coin collection is in a safe deposit box at a bank. Unfortunately, this is probably the most expensive solution too. Bank vaults are constructed to keep criminals and fire out. Bank vaults are made of a material that will emit water vapor that will hold down the temperature in the vault in case of fire. Naturally, some water escapes over time. Therefore, this would provide a very humid environment for your collection. The water vapor can be absorbed by placing a silica gel pack inside your safe deposit box. Remember to change it a couple of times a year to keep it fresh and absorbing as much water vapor as possible. A less expensive option is to purchase a safe for your home or office to store your coin collection. Once you purchase your safe, there is no reoccurring annual fee like a safe deposit box has. Unfortunately, home and office safes are constructed of the same material as bank vaults. You must also use a silica gel pack to absorb the humidity and prevent your coins from getting damaged. Wooden bookshelves and cabinets can emit harmful chemicals into the environment around your coin collection from the coatings, adhesives and the wood itself as it ages. Although not as secure as a safe, a locking metal cabinet will provide a safe environment for your collection since it does not have the problems associated with wood. Be careful where you locate your metal cabinet because metal tends to attract moisture in the form of condensation. Extracting this humidity from the air and placing it on your coins can be very detrimental. 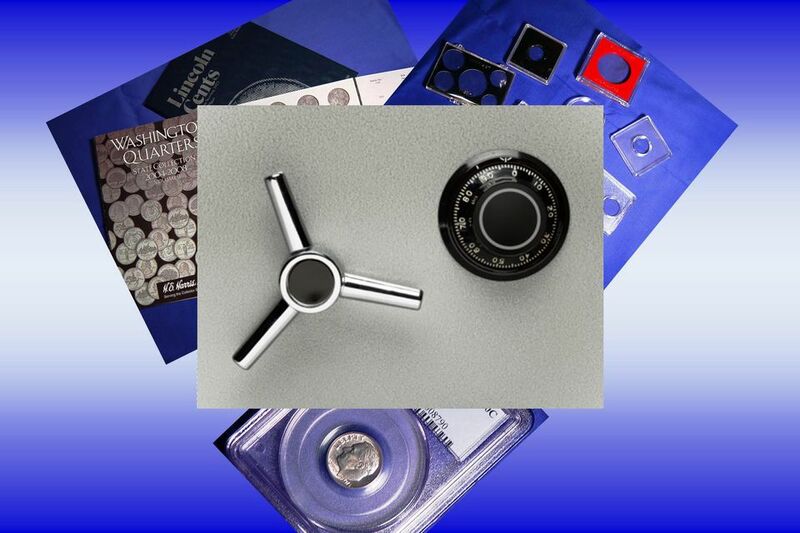 Protecting, preserving and storing your coin collection properly will ensure your coins will be enjoyed by generations yet to come.